Just a little disclaimer: first, I am not a car person. Remember that. I look at car features with the eyes of a mom. How will my family “fit” with this car? How easy is it to learn and how comfortable is it to drive? Second, I was given a 2014 Kia Forte to drive for a week. No other compensation was received, and all thoughts are my own. The top photo is a stock photo of the Forte, and all others are pictures I snapped myself….after a late-in-the-season snow storm that didn’t allow for clean, sparkly car pictures. It’s true to life, that’s all I can say! With three drivers in the family – and two cars – I have been eyeing smaller commuter cars to add to our “family” of cars. It has been rough having a daughter with an internship and an evening job…because it means we have to share my car. With FOUR other kids to cart around to piano and karate and play practice, I need something that I can drive back and forth. For many years, when my kids were little and I had a minivan full of car seats, I thought that it would be years before I would have a compact car for myself. Now that all of the kids are in school full time, it’s actually rare for all of us to be in the car at the same time. Usually it’s just me running errands or taking one or two kids to practices. And when there are only a few of us in the car at a time, it makes no sense for me to drive the big, gas-guzzling car. I was not prepared for how much I would fall in love with the 2014 Kia Forte. As I drove it for a week, I looked for things I didn’t really like about it and came back with nothing. It was comfortable. It had power. It had a ton of space (talk about fitting a lot of leg and cargo room in a small package!). It had the features I love. There wasn’t a single thing NOT to love about the Kia Forte. 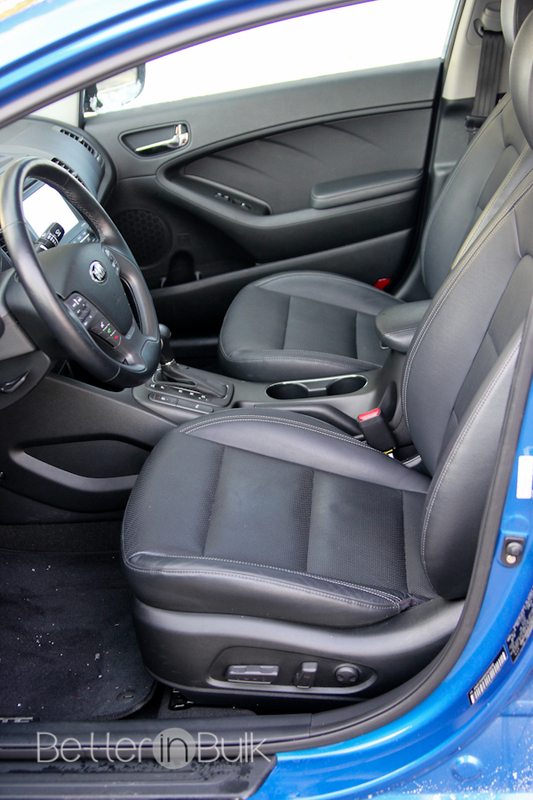 • Tons of leg room – my husband actually complained BEFORE the first time he took a ride in the Forte. He said, “Oh, do we have to take the little car? I don’t want to be cramped!” My 13-year-old son (who is almost as tall as Dad) piped in for me. He said, “Actually, the ‘little’ car has a ton of room. More than an SUV for sure.” Yes, you do have to lean down to get in instead of climbing up to a truck, van, or SUV, but once you’re inside…spacious! 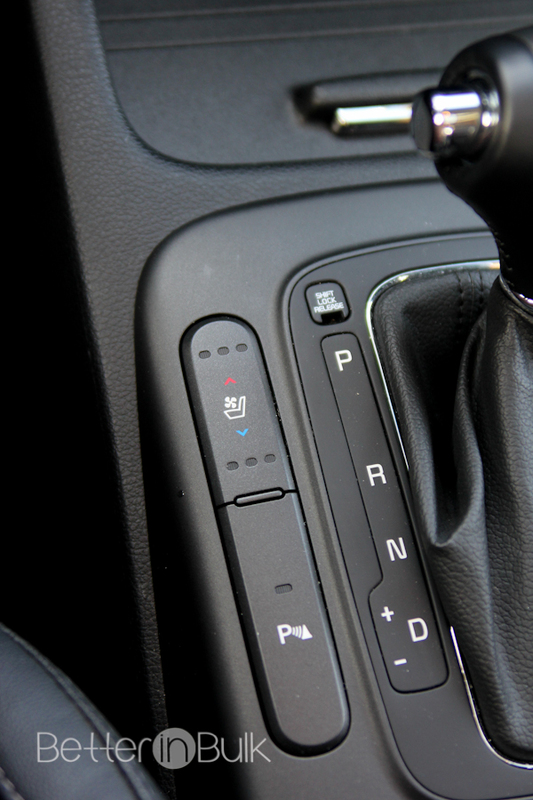 • Heated AND cooled seats – The front seats not only had heated seats, but (this was a first for me!) they had cooled seats. How I wish I could have driven this during the summer! The sensation was so *cool. * The kids (and hubby) loved that there were also heated seats in the BACK! • The trunk was huge – as someone who does large shopping trips, I really appreciate having plenty of space in the back. The Forte’s trunk was big enough for my 14 year old daughter to climb in comfortably. 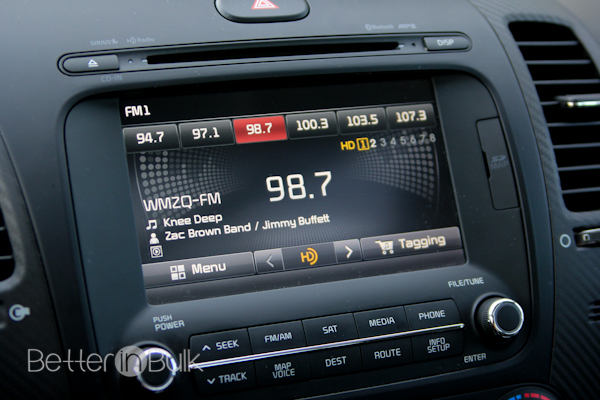 • The Infotainment System was awesome – from navigation to radio to pairing my phone, it was all easy to figure out and find, and the large touch-screen was a huge plus. • Rear camera (back up assistance) – I loved the back up camera, but I also loved that I could see out of the windows, too. I always felt very secure and comfortable backing the car up. 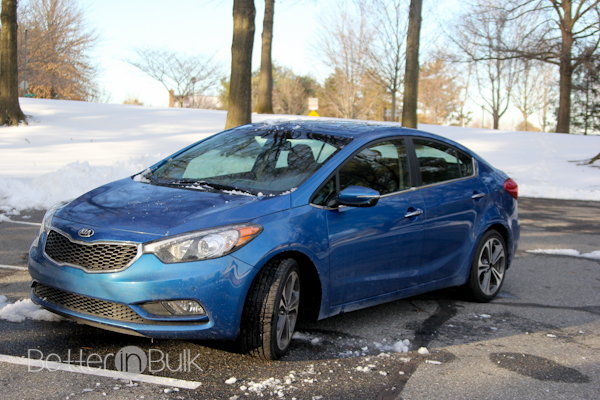 • Easy to maneuver – The Kia Forte was a breeze to drive…and so much fun! It took turns well and even managed the dirty, sometimes snowy streets in March! • Active ECO – means that you’re using fuel more efficiently. Less money spent on gas? I’ll take that! Here’s what Kia had to say about their Active ECO System: “Models with automatic transmission are equipped with the Active Eco System. 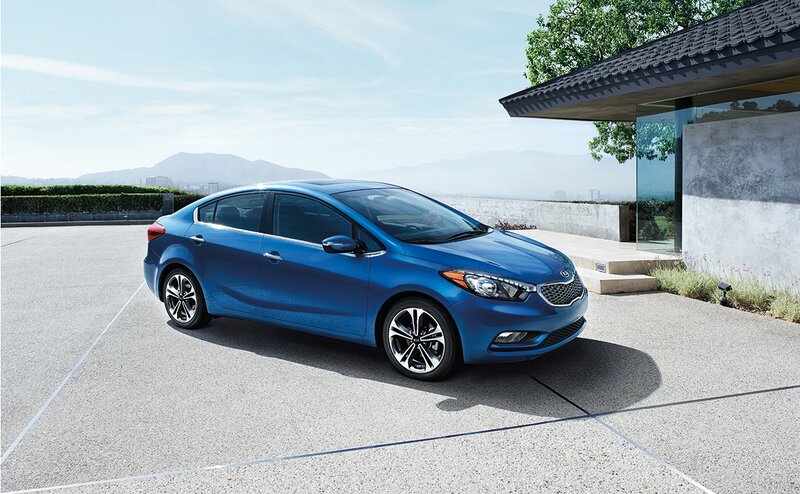 This feature adjusts the torque map, shift schedule, torque filtering, and idle RPM speed, to maximize fuel efficiency.” The Forte averages 25 MPG city and 37 MPG highway. I also love knowing how many miles I have left in the tank! 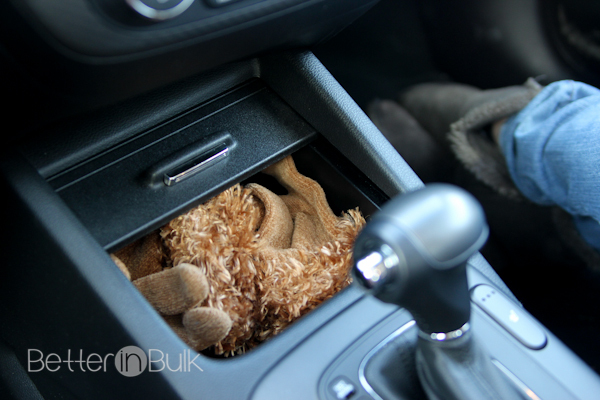 • Lots of places to stash my stuff – whether it was the large trunk, the sliding front center console between the front seats, the cooled glove box (for keeping cool things cool during the summer! ), I always found places to put my stuff. I loved the hidden spot I found for stashing my gloves, too! 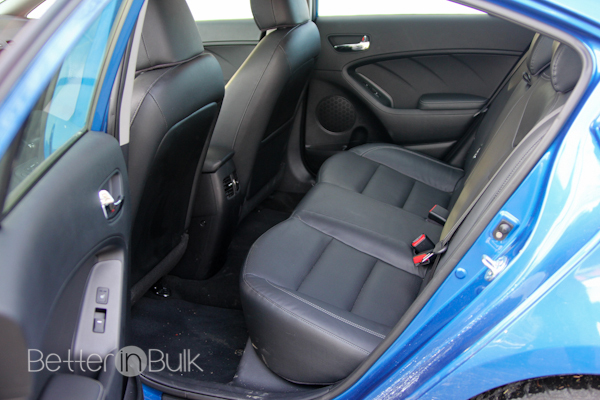 You can see the rest of the 2014 Kia Forte features – both standard features and optional features – on Kia’s website. 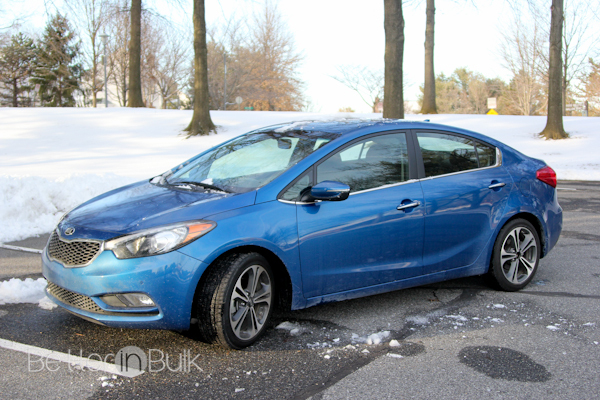 The bottom line: I loved the Kia Forte! I would highly recommend it as a commuter vehicle, a second family vehicle, or a starter car (I would have loved having this as my first car!). With a sticker price starting at $15,900 it’s in the affordable range, too! Wow I love the looks of this car!